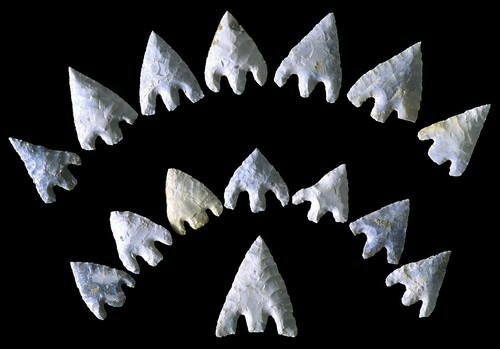 As this is UK forum I thought I'd start a post about the stuff traditionally made in this country, we've seen the stunning Danish Daggers, the lovely American clovis or the superb French Solutrian artifacts, what does a million years of British knapping have to rival it? So if anyone has any knowledge of British artifacts, please add it to this post. I'll start with the fabulous Barbed and Tanged Arrowhead, perhaps the finest arrowhead ever produce on these isles. There were severals styles and they were made from the mid/late Neolithic Age and right through the Bronze Age. 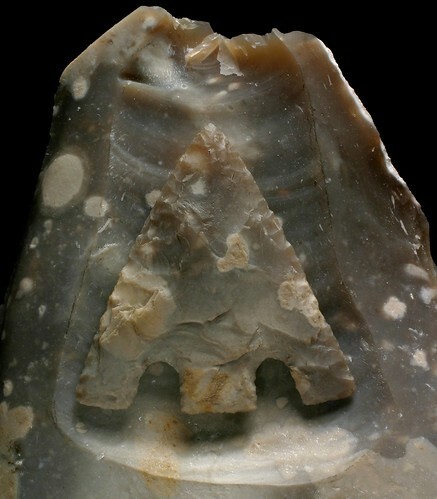 They are found throughout most of Britain and were undoubtably a pieces of high value, because the skills needed to make them, also by the fact they are found in rich burials and many more cruder arrowhead types were made at the same time for genral hunting use. Their most synonymous features are the beautiful parallel flaking found on some and the fine notching used to create barbs, both requiring a high level of skills by the knapper and being there for artistic reasons as they don't enhance funtionality. Just stumbled upon someone making one on you tube, rather on the large size, but beautiful none the less. 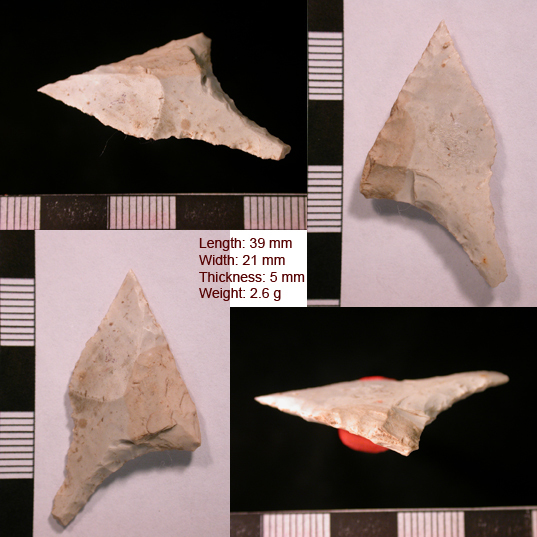 Here's another common type of UK arrowhead from the Neolithic Period, the Neolithic Oblique Arrowhead. 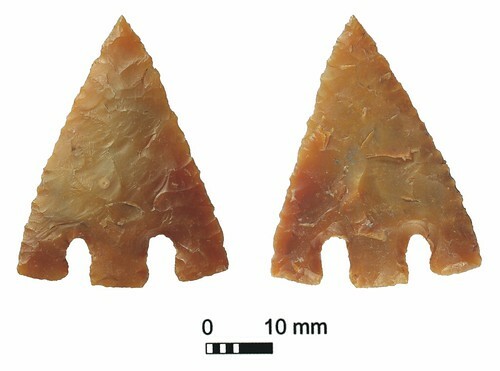 This type of arrowhead is a subset of Neolithic Single Edge Points, it can look amost like a regular arrowhead cut in half. 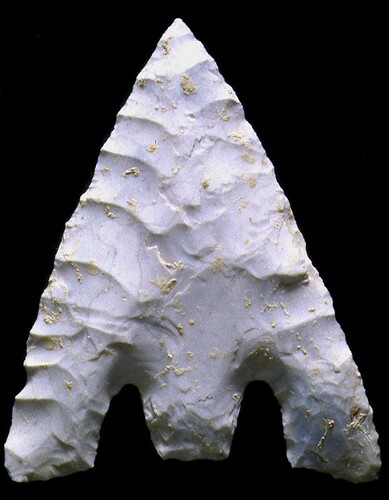 A variant of the Neolithic Oblique Arrowhead is the Long Tail Oblique Arrowhead which surely must have been ceremonial rather than for use. Here's a beautiful example found in Somerset made from beach pebble. Check out the long tail variant on the right from Norfolk. It's the middle one that is from Lynford, Norfolk, the other two are from the Marden "superhenge" in Wessex! Opinions are divided as to why such a long tail and how they where hafted. 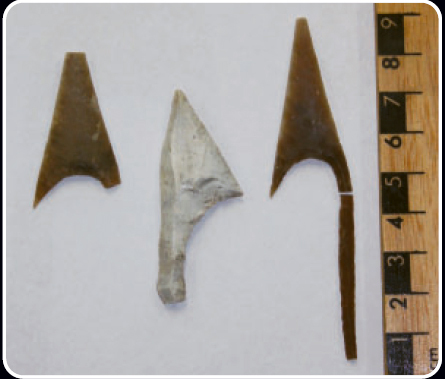 i think the arrow heads are at the top of british knapping - a friend who has now died found one in a mole hill, it was perect with curved hooked barbs. hi iam new so its taking me a while to get up to speed. unfortunately most of what i`ve seen is in museums and as my friend tell me i live in the mesolithc, i`m just getting used to this computer thingy. These are some great artifact guys. i guess there is probubly alot more british stuff under the north see around doggerbank heading toward denmark and mainland europe as the sea level was a lot lower around the early mesolithic. I am going to comb the norfork cost at the weekend so hope to get so finds. A good place to bone up on British artifacts is here. Just choose the manufacture method option as knapped and ignore the rest. The good thing about it is you get to see the real ordinary day to day stuff not just the extremely rare and fine pieces in museums. I know it takes time and practise but I do get frustrated when it`s made to look so easy. The guy in the video said about ripping the edges off when putting in the tangs. the only trouble is I never get that far I always snap the point off when I try to remove the bulb. I can`t quit see how he builds a platform around the bulp. could anybody please? 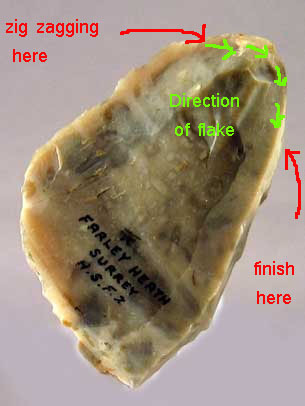 with a bulb of percussion you use the technique for creating a working edge. Start just before the bulb and work around just past it zig zagging the edge. Don't shoot flakes at the cetre but rather the direction you are heading. A perfect example is in this vid, basically a bulb of percussion is a square edge, so you treat it as such. When you have zig zagged it then you can take inward directed flakes to thin it. Oh yes the technique for pressure flaking and percussing, small pieces and big is identical. Hi thanks for the master class. Your a magician. i`ve had go and its coming on. its seems so obvious once you`ve been shown. sneek up on in from the side and not head on. cheers i`ll keep practicing. thats a great bit of help, i had just been banging the bulb making fractures, i will have a go at that later. thanks. Must admit, I put aside knapping for a month or so there. Way too much work on, and I had also reached that sort of plateu. You know the one, where whatever you do, it just falls apart and goes wrong. Sometimes when that happens, a little break gets you re-focussed.